The WB-57F currently serves as a traditional weather reconnaissance aircraft capable of storm tracking and standard photoreconnaissance missions. However, it stayed true to its roots by serving in a military capacity in Afghanistan, providing two-way communication between fighters, bombers, spy planes, and ground radio. Playing a major role in the country’s networked warfare efforts, the WB-57F acted as a universal translator that passed data between aircraft and ground units while carrying the Battlefield Airborne Communications Node system (BACN). Although now serving as a scientific research aircraft for the NASA Johnson Space Center, the WB aircraft was the first US jet bomber to drop bombs during combat. The aircraft retired in 1983.With its seemingly non-threatening looks, the WB-57F made its mark as one of the most capable tactical bombers and reconnaissance aircraft equipped with a twin jet engine. It’s simple and elegant design and color scheme conceal its true power and ferocious nature. This Canberra aircraft is now immortalized with this wood model plane. 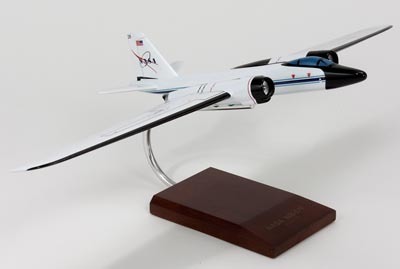 Sculpted by our skilled artisans from kiln-dried wood, this desktop model aircraft is one eye-catching museum-quality piece. Even non-collectors would agree that this is a handsome piece of history worthy of display in any home or office.